Well, well, well...aren't you the designated party planner of your gang? We know you are always hustling for the best party supplies and quirky props out there. So, we've curated a list of top places for party supplies to make your life easy. Let's get to planning parties, shall we? Party Monsterz, a party props supply store in Gachibowli, is sort of a hidden gem. It has everything from party hats to photo booth props. Walking through the store, we put on party hats, fancy masquerade masks and looked at glorious disco balls hanging from the ceiling. We found fairy wings, tutu skirts and pirate kits for children, and sashes with ‘Beauty Queen’ and ‘Bride To be’ among others printed across them. Tiaras too, for birthday girls to rock on can be bought from here. 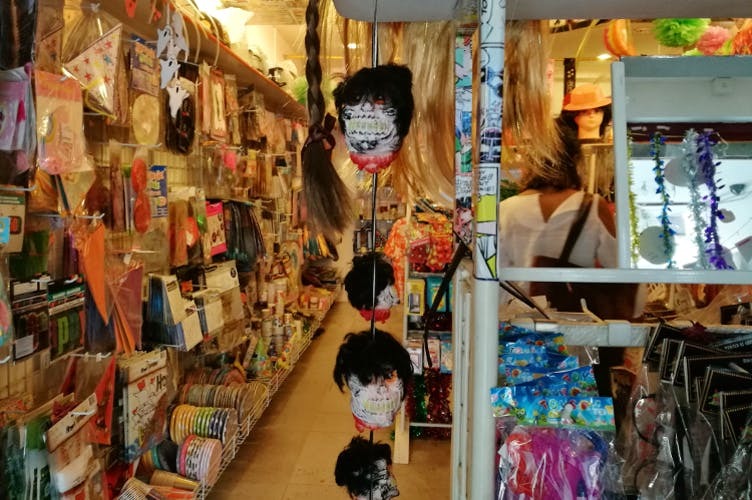 There were wigs, with rainbow hair, bright red or blue hair, and coloured Afro wigs too. Regular balloons are so yesterday. We're moving towards themed balloons and the ones that can sing melodies for our parties. Wondering where to get them? Balloons Unlimited is your shop. We found balloons in cool emojis, satin hearts (whaaat? ), minions, and stars. The starting price of a balloon is INR 6 and it can go up to INR 799. Bridesmaids and mommas are sure to hit a treasure trove with the vast collection of balloons, props. You really cannot go wrong with Shraddha Extension and any of its outlets. Right from balloons to confetti, wall hangings and all things fun, this has been our go-to for years now. Plus, knowing how pocket-friendly the prices are, it's best to go here because they stock up regularly. Want something that's not at the store? Place a request with the nice peeps at the store, a little in advance, and they bring it for you. Are themed house parties more of your thing? You've got to check out Hyderabad Party Shop in Osmangunj which is a wholesale store with plenty of props, balloons, and kitschy decor. The store abounds in various types of balloons including foil balloons, themed balloons like minions, unicorns, emojis, satin hearts. Plus, there are funny face masks (good quality too) that share aisles with scary ones. If you are specifically looking for something (to up your party game), talk to the staff. If you live in and around Kukatpally, Rocking Parties might be your go-to for all party supply needs. And why not? For they stock up on cutesy soft toys, face masks (V for Vendetta, anyone), colourful paper cups and plates, party hats. We love their glow in the dark balloons, Minion balloons, kitschy paper bags, cool goggles too. Go here and lose yourself in a confetti world. We know Secunderabad is full of surprises when it comes to party supply stores and stationeries. Prakash Party Shop is one such store where you can load up on adorable Pikachu and Minion balloons. They stock up on a wide range of paper lanterns, return gifts for children. One noteworthy thing about the store is you won't find a balloon collection this vast anywhere else. Plus, they undertake bulk and party decoration orders too. Taking the concept of themed parties a notch up, Party Hunterz in Trimulgherry is probably one of the best party supply stores in Hyderabad. No, really. With an informative website where you can take a look at the products they offer, you're almost tempted to throw a party by looking at their casino or cupcake themed products. They have quirky tableware, but what we love are the drinking games like Carry Me Home, Drinking Roulette, Ship Wrecked Party. Plus, they have costumes too. From Batman cape and Great Gatsby style outfits to Elvis Presley costume and Jack Sparrow's hat, they have it all.